Terry Tiffee: 2005's Lew Ford? Unfortunately for most of us in (as well as outside) Twins Territory, Wednesday's Twins vs. Tigers game was not broadcast on television - for some reason the waning moments of an extremely overrated team's now-hopeless "playoff push" took preference last night (postscript: I'm told those reasons were contractual... too bad for FSN). That was unfortunate, because yesterday's game sounds like it was an extremely entertaining one. Anyway, that brings me to the title of today's post: Terry Tiffee. 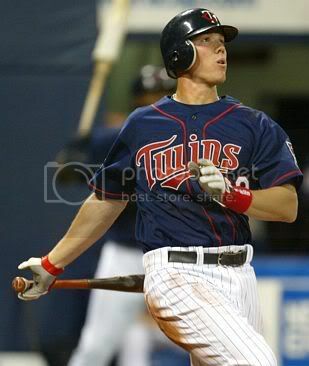 As you probably well know by now (I'm not naive enough to think that TC is the first stop on everyone's web browsing schedule) Tiffee was the star of last night's game, going 2-4 with a double, homer, and 3 RBIs in his first game up from AAA. He even hit in the cleanup spot! Even before that surprising performance, it seemed like every semi-knowledgable worth his/her weight in off-color Teflon Twins fan has an opinion one way or another about this 25 year-old corner infielder. Since I would lump myself in with that group of people (perhaps even near the head of the class) and I am paid so very un-well to share my opinions with all of you, I'll briefly summarize my opinion of the Tiffmeister (as he shall from now on be called). First of all, all of you are exactly right: Tiffee definitely deserved to make the team out of spring training. He didn't impress me that much the time I watched him down in Florida (and I heard conflicting reports about him from people "in the know", if you will) but his numbers were very good overall. Instead, concerns (arguably overly-cautious concerns) about The Knee led to the retention of Corky "Corky" Miller, who appears to be nothing more than your standard AAA catcher but with a funky first name. Despite the fact that he has never been considered a top-tier prospect, Tiffee has done nothing but hit in his time in the big leagues. He was outstanding as a replacement for Koskie last September before he went down with a season-ending injury partway through the month, and appears to have picked up right where he left off. My rhetorical questions for you are as follows: Is there a chance that Tiffee could become 2005's version of Lew Ford for this team, the unsung seasoned minor leaguer who steps in and exeeds expectations? Or is he simply a mid-level prospect who has been lucky enough to play his best baseball in the majors? Conventional wisdom says that he doesn't have the skills (bat speed, hands, etc.) to cut it as an everyday player, but then again, conventional wisdom has been known to fail on occasion (see Eckstein, David). Say (theorectically speaking, of course) that Tiffee continues to hit at a torrid pace. 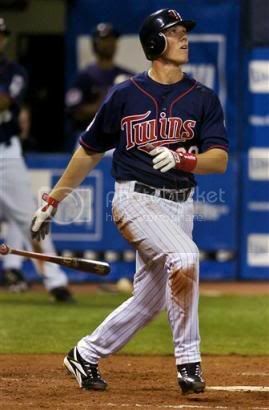 Who would he replace in the lineup once Morneau returns? Cuddyer? Ford? Rivas, perhaps? I must admit that despite my initial skepticism (I've never considered Tiffee to be a potential starter in the majors) the possibilities are intriguing, and I'm all for anything that improves this team. Anyone else have any thoughts on the issue? I realize this discussion is extremely premature, but I just thought I'd get a jump on what may become a hot issue over the next couple of weeks. Either way, it's getting late and I'd best be going to sleep. Tomorrow's game will be on TV (thankfully!) so I'm sure we'll have something more substantial for you then. Take care, everyone. Two different photos of Tiffee's fourth inning home run.